Centralnie położony apartament i jeszcze spokojne życie. Apartament znajduje się w centrum Pireusu, do którego można dotrzeć środkami transportu publicznego, w pobliżu deptaka, gdzie można znaleźć wszelkiego rodzaju sklepy, restauracje i kawiarnie, lub na promenadzie w pobliżu przystani (Pasalimani). Jest również połączony z portem Piraeus i lotniskiem. Jest to idealne miejsce na wizytę w Atenach lub codzienne wycieczki na wyspy, choć można też odwiedzić pobliskie plaże. Mieszkanie jest przestronne i jasne, całkowicie odnowione, z wysokimi sufitami i podłogami z czarnego marmuru, urządzone z dbałością. Szampon, suszarka do włosów, ręczniki, środki czystości. Das Domizil befindet sich in einem TOP Zustand. Die Lage ist perfekt. Helena ist fantastisch!!! Vielen Dank fuer euren Besuch und fuer die netten Kommentare.Ich habe mich sehr ueber unsere Bekannschaft gefreut und ich hoffe, dich, Josefine,JamieAthina und Ophelia nochmal bei uns begruessen zu duerfen. This very comfortable flat is within the Passilimani neighborhood of Piraeus, loaded with shops and restaurants and three blocks from Zea Marina. Super clean with all conveniences and warm people offering every support needed. Highly recommend. I traveled alone to Greece, and I had the opportunity to stay in this wonderful VRBO. The host was exceptional, and accommodating at every turn, even when I left my phone in the taxi, she helped me retrieve it. It is close to Piraeus port, and the city, and an easy cab ride away to Athens. Walk along the port, and you can look back onto Athens, and it is just lovely. The apartment is beautiful, and clean, and modern. Since I was alone, I worried about safety, but i had not fear here. I was able to do laundry, and she left a welcome gift in the fridge. I felt like i was in my familys home. She will help with anything you need, ideas for places to see, and suggestions for restaurants etc. It really is the best place to stay if you are going to see the entire area, and maybe even take a ferry to an island. Dear Marcie, you are really lovely, polite and always with a big smile.You are also a great gast, very quiet und you leave the aparment very very clean.I hope i can host you again und again soon. Zentral, sauber und gemütlich. Alles drinn , was man braucht. Eine sehr nette Vermieterin. Die Ferienwohnung ist in einem sehr guten und sehr sauberen Zustand. Uns hat es sehr gut gefallen. Wir würden jederzeit diese Wohnung wieder buchen. Liebe Sabine, vielen Dank fuer Ihren Besuch.Sie waren tolle Gaeste und sehr nett.Wir hoffen, Sie bald wiederzusehen. My husband and I stayed for 2 weeks in Feb 2017. 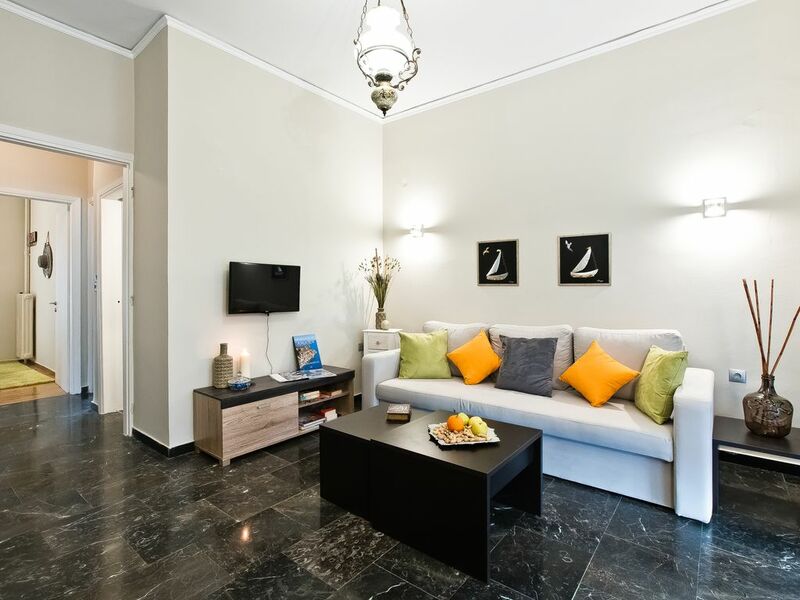 We were pleased with the apartment and we enjoyed the area of Pireaus. The owner Helena was helpful and very kind. We would recommend the apartment for vacation close to Athens. Apt. Was clean and supplied with what we needed. We love to walk and walking was necessary to obtain metro or groceries. Thank you Helena for being so helpful and friendly. Excellent guests, nice and friendy people. We hope to host them again. Schifffarten grać na wyspach, Kreuzfarhten, atrakcje, zakupy, życie nocne, piesze wycieczki, kręgielnia, Koncerty, koszykówka, siatkówka, siatkówka plażowa, pływanie.